Among machinable plastics nylon is one of the oldest machinable plastics and one of the most widely used machinable plastics. Since it’s earliest days in the 1930’s nylon has found it’s way into virtually every industry. But there are different types of nylon so how, or why does it matter which one? Nylon types or grades have varying properties so it can be important to look at what the differences are between each nylon material and to test it for your application before going into part production. Nylon 6 and 6/6 are the two most common grades, but there are filled versions of those and other grades including 6/4, and 12. The number refers to the number of methyl groups on each side of the nitrogen atoms (the amide groups). Nylon can also be known by its true name – polyamide. This last point comes with a but wait!*…. Does this mean nylon is ONLY good in dry environments. No, there are a number of factors like fillers and the type of nylon. Some types of nylon do not have a high rate of moisture absorption, like Nylon 6/12 which is designed specifically to have a very low moisture absorption rate. 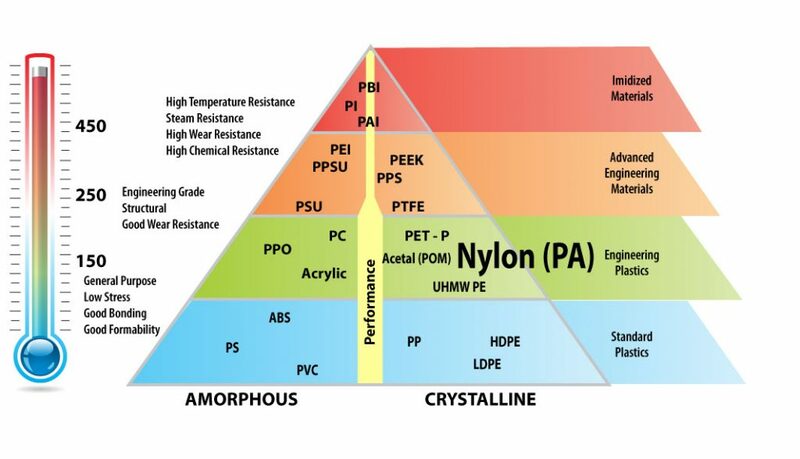 But this comes with trade offs so comparing all the properties and asking yourself ‘what must this material do’ is essential in selecting a nylon that meets your particular application needs. Below is a general example of the differences between Nylon 6 and Nylon 6/12. What Are Nylon Shapes Used to Make? Nylon is often chosen to replace bronze, brass, aluminum, or steel parts. As industrial environments look to improve quality and safety, many have replaced metal parts with nylon in order to reduce noise. Nylon also weighs approximately 1/8 an equal amount of bronze making the handling of large parts easier. It’s ability to withstand wear and to be self-lubricating can also reduce maintenance and replacement downtimes. Pair these features with nylon’s resistance to wear and nylon materials with properties that are enhanced with fillers or lubricants and you can have a powerful reason to look at changing from traditional metals to nylon parts. Nylon is easily machined using the same tools used to machine metal parts. Nylon shapes are also available in a wide range of sizes, and some manufacturers will provide customized nylon materials in specific colors and sizes. The food processing industry benefits from FDA compliant versions of nylon that are blue in color which aids in detecting plastic particles. This is helping to reduce food contamination and food recalls. Among these trade names are a number of nylon materials that include MoS2 filled, oil filled, and more. Each nylon material is available in sheet, rod or tube in many sizes and colors. The fillers will enhance specific properties so you can find a nylon that is a good balance of application performance and cost. To learn more about nylon shapes we also have more information on our online catalog at onlineplastics.com and we have a handy infographic that looks at another aspect – Cast Nylon vs. Extruded Nylon. This entry was posted in Uncategorized on November 16, 2016 by ainadmin.